Unicum is a Hungarian herbal bitters, drunk as a digestif and apéritif. The liqueur is today produced by Zwack according to a secret formula of more than forty herbs, and the drink is aged in oak casks. During the Communist regime in Hungary, the Zwack family lived in exile in New York and Chicago, and Unicum in Hungary was produced using a different formula. Left: A frosty bottle of Unicum. After the fall of communism, Péter Zwack returned to Hungary and resumed the production of the original Unicum. Recently Zwack has also launched Unicum Next, a thinner-bodied drink with a more prominent citrus flavour. Unicum is regarded as one of the national drinks of Hungary. The production facility offers tours which include a tasting session of the three different varieties (Unicum, Unicum Next, and Millenicum). Though Millenicum was a special edition, it can still be found at a few retailers. It is a little stronger than the standard, with a slightly sweeter aftertaste. Zwack Frissitők is a pineapple-based version of the drink. 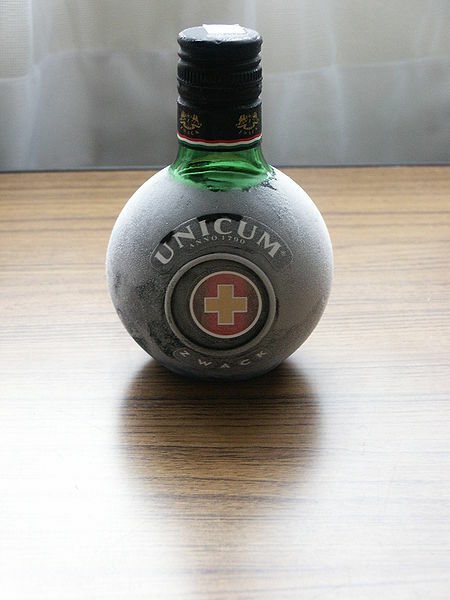 Unicum is available through select spirits distributors throughout the United States, as is Unicum Next, re-branded as "Zwack".